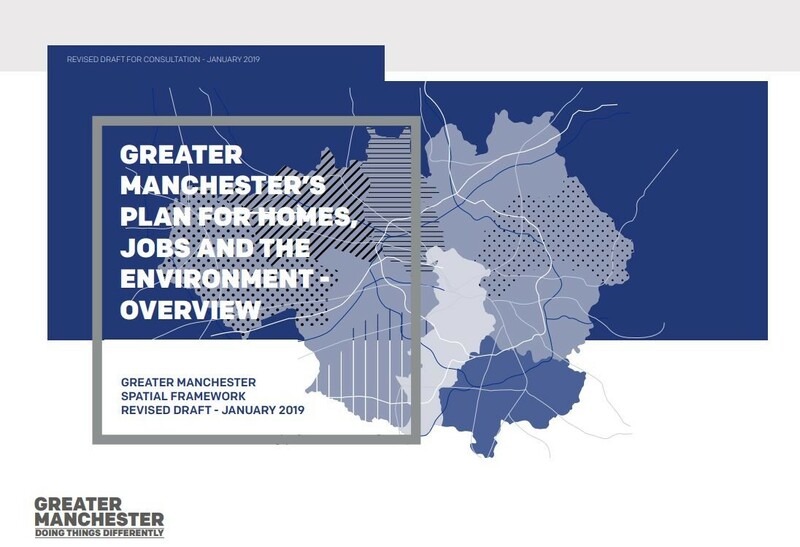 On Friday 11 January, Greater Manchester’s leaders will agree to kick-off an eight-week consultation on the new GMSF, which is likely to start on 21 January and end around 18 March 2019. With many commentators putting Andy Burham’s thumping victory in the 2017 mayoral election at least partly down to his commitment for ‘no net loss’ to the City Region’s Green Belt, attention will rightly focus on whether this pledge has been met. But with local elections scheduled for May and the Mayor set for re-election next year, the Combined Authority will be hoping that the revised draft fairs better with the electorate than the previous version. The latest plan proposes 26,000 fewer homes – down to 201,000. The ten local authorities have put a lot of work into reducing Green Belt release. All ten authorities are Labour-led, and the three councils that Labour could realistically lose their leadership of in May (Stockport, Trafford and Bolton) have seen big reductions in Green Belt release. The political test will be whether the ruling groups can persuade voters that the reduction is a win and goes far enough to meet Andy Burnham’s promise of a ‘radical rewrite’. With the consultation period ending just a couple of weeks before the local election campaign starts, there will be a lot riding on the plan’s success. Northern Gateway: large, nationally-significant employment land in South East Bury and South West Rochdale along with around 3,300 new houses at Heywood/Pilsworth, Simister/Bowlee and Whitefield. The proposal includes a new motorway junction between J18 and J19 on the M62 and several new schools. The site has slightly reduced in size from the previous version. Stakehill: 250,000 square metres of employment space along with 900 “high quality homes” in Rochdale and Oldham. Kingsway South: 310,000 square metres of employment space and 700 new homes in Rochdale and Oldham. Bolton has seen a significant reduction in Green Belt release in the new draft. Three sites: Bewshill Farm, Chequerbent North and West of Wingates/M61 J6 will provide around 490,000 square metres of space for industrial uses. A big release east of Westhoughton has mostly gone. Bolton is on a political knife-edge, with the May local elections giving the opposition parties a genuine opportunity to push Labour out of power in the borough. The council’s leadership has fought hard to get a good outcome and will be hoping the electorate reward them at the ballot box. The allocation changes in Bury are minor. In addition to the Northern Gateway cross-border site, Elton Reservoir offers 3,500 new houses, Walshall 1,250 and Seedfield 140. A couple of small sites have been dropped from the latest plan, but overall it has changed little. Labour’s majority of nine over all other parties combined looks safe enough ahead of the May local elections. By far the most urbanised of the ten authorities, Manchester has little green land to release. The three allocations from the previous GMSF draft: employment land near Wythenshawe and the airport, plus space for 20 houses at Southwick Park, remain. This should not disguise Manchester’s ambitions. The authority proposes a lot more high-density building on brownfield sites. That includes significant housing from the allocations of other authorities. With 94 of 96 councillors, the political risks to the ruling Labour group come more from internal spats than defeat at the ballot box. Manchester Labour has used its political strength to take additional housing numbers from its more politically-balanced neighbours. With Labour dominant in Oldham (they have 45 councillors, the other groups combined have 15) the council has retained its proposed new sites from the previous version of the GMSF and even added some more – albeit very small ones. Ashton Road Corridor will take 260 new homes, Thornham Old Road 600, Beal Valley 480, Broadbent Moss 1,450, Cowlinshaw 460, Hanging Chadder 260, Woodhouses 260, Roberts Fletchers 170 homes plus around 6,000 square metres of employment land, South of Rosary Road 60 homes and Spinners Way/Alderney Farm 50. With vocal and organised campaign groups (plus well-healed neighbours close to two of the allocations) in Oldham we can expect residents to continue to pressure the council to rethink the plans. Another strong Labour authority, Rochdale is keen to build, and especially keen to have larger homes attracting higher-income residents who pay more council tax. In addition to the large cross-border Northern Gateway, Stakehill and Kingsway South sites, Rochdale proposes seven others. Bamford/Norden will deliver 450 new homes, Castleton Sidings 125, Crimble Mill 250, Land North of Smithy Bridge 300, Newhey Quarry 250, Roch Valley 210 and Trows Farm 360. Expect the Bamford/Norden allocation to be the most controversial allocation in the borough. Like Manchester, Salford is building, and building fast. A lot of this focuses on brownfield sites out towards Salford Quays. The proposed Green Belt release is very similar to the previous GMSF draft. The changes are a smaller allocation around Irlam and the loss of a cross-boundary piece of land east of Astley. Land at Hazelhurst is proposed to offer 400 new houses, East of Boothstown 300 and North of Irlam Station 1,600. Additionally a major expansion of Port Salford will create around 320,000 square metres of new employment floorspace to the north and west of Barton Aerodrome. Labour-led but in no overall control, Stockport is the most likely authority to block progress on the GMSF. For it to be approved, one of the Stockport opposition groups (Lib Dems or Conservatives) must either abstain or support it. If both oppose the plan on a ‘Save our Green Belt’ platform, the whole framework collapses. The area to watch out for is High Lane and Marple where a Liberal Democrats/Conservative battle could decide both whether Labour stay in power on the Council and whether the GMSF progresses across the City Region. As with other politically tight authorities in Greater Manchester, the number of houses needed has dropped sharply. Manchester has taken a lot of those. Stockport Town Centre is also set to be the guinea pig for Andy Burnham’s Mayoral Development Corporation (MDC) though it’s unclear at this stage exactly what that will mean. Around 90,000 square metres of land for new industrial and warehouse employment is proposed for Bredbury Park: a plan that the local Labour and Conservative MPs (Andrew Gwynne and William Wragg) have joined forces to oppose. A new allocation on the Former Offerton High School site will provide for 250 homes, Gravel Bank/Unity Mill 250, Heald Green 850, High Lane 500 (greatly reduced), Hyde Bank Meadows 250, Griffin Farm at Stanley Green 850 and Woodford Aerodrome 750 (another big reduction). Tameside sees a surprisingly large fall in proposed Green Belt release, given Labour’s dominance on the council with 51 out of the 57 seats. The large northern part of the Ashton Moss/Littlemoss site is no longer proposed for release, and several smaller sites in the north and east of the borough have also been removed. Still in for Green Belt release are just three sites: Ashton Moss West: 170,000 square metres of employment floorspace, Godley Green Garden Village with 2,350 new homes and South of Hyde with 440 homes. Trafford’s minority Labour administration took power last May on a promise to oppose Green Belt release, and politically it is essential for them to have a good story to tell before the May elections. So while the two biggest sites (Carrington and the Timperley Wedge) remain, the land on the western edge of Sale and at Flixton Station is no longer in the plan. The Carrington site proposes 6,100 new homes, with 2,400 at Timperley Wedge. Wigan, like Tameside, is a safe Labour authority which has none-the-less lost several of the sites previously marked for Green Belt release. Of the eleven in the previous draft, five remain – though it has been the smaller sites which have been dropped. Land South of Pennington is allocated for 160,000 square feet of employment land, with another 140,000 square metres proposed for Junction 26 of the M6. North of Mosley Common takes 1,200 new homes, Pocket Nook 600 and West of Gibfield 700. This latest draft of the GMSF does a much better job of marrying together new housing and employment land with the infrastructure it needs. But with pressure from campaigners to further minimise Green Belt release and question marks from the private sector about the deliverability of such a large proportion of new homes within the urban core, there is a risk that much like the Prime Minister’s BREXIT deal it will satisfy no-one. BECG is the UK’s first dedicated, sector-specialist communications consultancy for the Built Environment. Get in touch for a chat about how GMSF affects your business. Please complete the form below to receive the latest news, events and information from BECG.